ETD are planning to start four new multi-client or Group Sponsored Projects (GSPs) at the start of 2018. This is a good opportunity to consider how you can benefit from this offer of being involved in any of these four projects, or a currently running project, for a fraction of the total project cost. Apart from the data and reports/guidelines produced there is much learning through other project partners and experts during the on-going discussions and six-monthly project meetings which partners can attend in person or by Skype/ Video-Conferencing etc. Details of the projects and the opportunities being offered can be seen by clicking on the image. To read the Technical Proposal Outline please click on the Proposal Image. 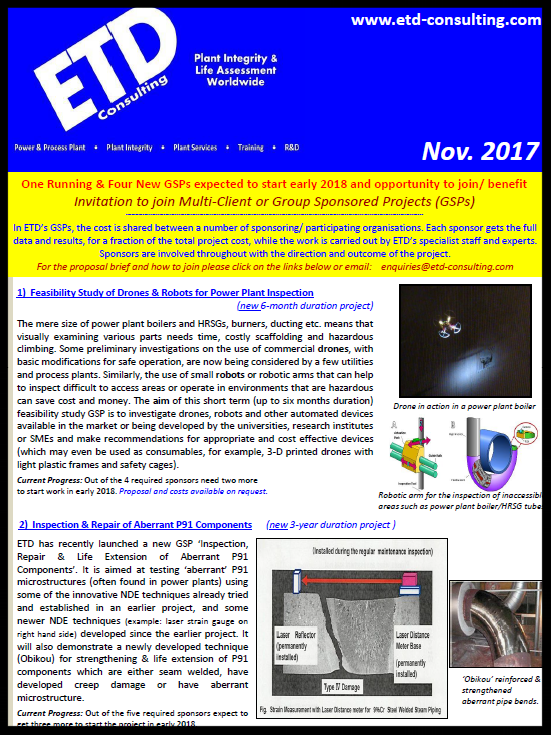 ETD has launched a new proposal for a Group Sponsored Project. The proposal is entitled ‘CRACKFIT – Defect Assessment Tool for Boilers/Pressure Vessels & Turbines’. Crackfit© is the ETD’s commercial procedure and software for assessing cracks in pressure vessels, piping and standard fracture mechanics specimens, both at low and high temperature. It is based on the prototype initially developed with the support of the European Commission and European industry. The commercial version was developed by ETD as a joint venture in collaboration with the European industry and independently verified by experts. Crackfit carries out crack and life assessment both deterministically and probabilistically - probably the most advanced procedure for probabilistic crack assessment. Crackfit significantly reduces the time required to carry out assessment, in some cases from weeks to days! Crackfit comes with an optional crack initiation and growth database for base metal, HAZ and welds and for many materials of interest to industry. It deals with defects such as lack of fusion / penetration in welds (defects at weld toes), internal and external surface emerging or embedded defects in straight pipes and pipe bends, defects at stress concentrations such as sharp corners (T-pieces, nozzles), defects in plates etc. The software is user friendly for industry engineers who would like to carry out defect assessments without having to go through the different established codes or country / in-house defect assessment practices. Procedures including BS7910, the French code RCC-MR A16 and the European procedure ‘HIDA’ are available as software options. The software allows for failure analysis (fast fracture, plastic collapse and ligament rupture) and the evaluation of damage mechanisms such as creep, fatigue, and creep-fatigue interaction. ETD will provide a commercial license of ‘Crackfit’ software for the unlimited use of company’s own use. ‘Crackfit’ is a commercial Procedure and interactive Software for the assessment of the initiation and growth of cracks in low and high temperature plant (power, petrochemical, refining, process etc.) pressurized components. Crackfit aims to make life assessment on various component geometries (such as Straight Pipes, T-pieces, Pipe Bends, Plates) which may contain defects such as ‘lack of fusion in welds’, ‘lack of weld penetration’, ‘manufacturing’ or ‘service induced defects’ real, assumed or design allowable defects/cracks. Similarly various crack geometries including embedded and surface emerging defects are dealt with in this procedure. To learn more about CrackFit please click here. ETD engineers will provide training to the client’s engineers on the appropriate use of the ‘Crackfit’ software. This two day training intends to provide in-depth knowledge of the appropriate use of the software. The first part of the training involves the introduction of all features of the software to the user and the second part involves use of the software for solving practical problems with examples from ETD’s work for its clients. Creep and Creep/Fatigue Crack Growth. For the examples of training courses that ETD can offer, please click here. ETD will provide 6 months tutoring/support on practical problem solving related to creep crack growth after the initial training. ETD considers that this initial tutoring will be necessary for the client to become confident enough to solve their industry problems on their own (i.e., components with cracks covering various geometries such as plain pipe, pipe bends and T pieces with surface emerging and embedded cracks). ETD will provide support and training in Creep Crack Growth testing of fracture mechanics type specimens. This training will include three tests on each material of interest to the client. The data will then be provided to the client as crack initiation and growth data. They will then be able to compare this data with the data and scatter bands in ‘Crackfit’ and find out where their material or cast lies in the scatter band. This training will involve both CCG testing and data analysis. If you are interested in any of these services, then please feel free to contact us. ETD Consulting hosted a Defect Assessment webinar on 17 September 2014. If you missed it, you can now view a recording of the webinar by clicking below. This webinar includes a worked through demonstration of ETD's Defect Assessment software, CrackFit. CrackFit is available for rental or purchase and you can read more about CrackFit here.